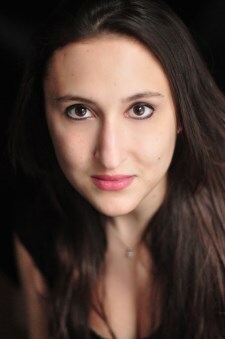 Soprano Julia Sitkovetsky trained on the Postgraduate Vocal Course at the Guildhall School of Music and Drama, studying with Professor Susan McCulloch. In September 2014, she will be taking a place at the Wales International Academy of Voice, continuing her studies with Dennis O’Neill and Marie McLaughlin. Operatic roles include: ‘Flora’ (cover) in Britten’s The Turn of the Screw at Glyndebourne and at English National Opera; ‘Damon’ Acis and Galatea, ‘Miss Jessel’ The Turn of the Screw (Oxford Opera); ‘Galatea’ Acis and Galatea (New Chamber Opera); ‘Betty’ Salieri’s Fastaff (NCO), ‘First Witch’ Dido and Aeneas (Orchestra of St John’s), ‘Eurydice’ Orphee aux Enfers (NCO) and ‘Elisa’ Il Re Pastore (NCO); ‘Zerbinetta’ Ariadne auf Naxos; ‘Sophie’ Der Rosenkavalier; ‘Madame Herz’ Der Schauspieldirektor and ‘Jano’ Jenufa (all GSMD). Recent successes include: understudying Diana Damrau in the lead role of ‘Moll Hackabout’ in the world premiere of A Harlot’s Progress by Iain Bell at Theater an der Wien; ‘Imogen’ in Journeying Boys, a project devised and directed by Iain Burnside at Guildhall; Soprano solo in De Staat by Louis Andriessen at the Queen Elizabeth Hall, London. She was a finalist in the 2014 Royal Overseas League Competition and a 2014 YCAT finalist at the Wigmore Hall. Current and upcoming engagements in 2014 include: Bathilde (Cover) and Chorus Vert Vert with Garsington Opera; ‘Monica’ The Medium (Menotti)with the Grimeborn Festival at the Arcola Theatre, London; a recital of Richard Strauss songs with Gavin Roberts in the ‘Song in the City’ recital series; Soprano soloist in a concert of Italian arias and Mahler Symphony no. 4 with Dmitry Sitkovetsky and the Greensboro Symphony Orchestra, NC, USA. Julia is generously supported by the Worshipful Company of Needlemakers, The Guildhall School, The Seary Trust, Elisabeth J. Roberts and the Joan Conway Scholarship.